The Encores! series of semi-staged musical revivals at New York’s City Center gave us the 1996 production of “Chicago” that just keeps rolling along on Broadway, but my favorite show in this series was presented a year later: Kern and Hammerstein’s 1929 “Sweet Adeline.” In it, a comely young thing named Addie Schmidt sings German ballads in her father’s beer garden in New Jersey. In the same team’s 1932 “Music in the Air,” which just had an Encores! 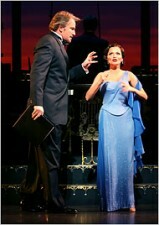 run (with Douglas Sills and Kristin Chenoweth, pictured), another sweet lass sings for her father, but in the old country: Bavaria. There, the daughter, Sieglinde, her music-teacher father, Walther Lessing, and her schoolmaster beau, Karl, make a trip to big, bad Munich, where they meet a big, bad she-wolf, Frieda Hatzfeld. Frieda, a theatre diva with an eye for young-male flesh, and her professional and sometime personal partner, Bruno Mahler, a performer with an even wider eye for young-female temptation, cast their lustful gazes on the village rubes. “Music” is, rather, a light comedy about operetta. This concert’s adaptation by David Ives strives to streamline the dialogue, which is sometimes rhymed, but it would probably make more sense to an audience for whom operetta conventions are second-nature. Even contemporary theatregoers well-versed in Jeanette McDonald (or in Gloria Swanson, who starred in a 1934 movie version of “Music”) might find, as I did, this evening simultaneously too curdled and insufficiently fresh. Like the lecherous Bruno Mahler, one must grab thrills where one can. Mahler’s interpreter, Douglas Sills, has that rare gift among today’s musical-comedy specialists: an ability to find the humour in inane period situations. If his arch line readings suggest the parodies on the old “Carol Burnett Show,” all the better. Kristin Chenoweth’s Frieda ogles Karl like Madonna sizing up her latest boy toy; unlike Madge, Kristin can both act and hit a high C. As for Sierra Boggess, who trills Sieglinde sweetly, you can hear why she’s in line to star in Lloyd-Webber’s “Phantom of the Opera” sequel. He’s Not Dead — And We’re Glad!